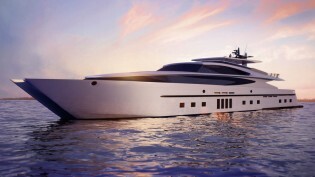 47m Motor Yacht Super Cat 154 by SFG – Superyachts News, Luxury Yachts, Charter & Yachts for Sale. Gianni´s luxury yacht Super Cat 154 is comprised on a raised pilot house design with a 154ft LOA and a beam of 40ft. The large open fly bridge contains a super state of the art console (centrally located) with three comfortable pilots chairs. To port and Starboard concealed foldable wing stations can be found for easy docking/maneuvering. Two large split settees are situated aft of the console for entertaining and dining. Centrally located on the fly bridge is a large double sided bar that with ample space for crew to work around. Amenities that the bar offers are barbeque, sink, mini fridge, freezer, wine cooler. Seating around the bar offers views both forward and aft. Behind the bar is an open U-shaped aft deck with different options for deck chairs, and the available space for up to 4 wave runners. Built-in seats designed with comfort in mind can be found on the bow. On the very foredeck is a large sun pad that conceals a massive storage locker underneath. On the aft deck the SC 154 yacht sports large doubled sided couches along with another bar and a hot tub that doubles as a small pool. The Hot tub is designed to overflow in between both hulls to create a waterfall effect. The current interior design of the 47m super yacht Super cat 154 is that of an open design with a double main salon with a very nice bar, game table, oversized, double height couches that will be enable guest to sit along the large salon windows for an exceptional view. Being offered as a semi custom design, the interior can be fully customized to fit the clients needs. The immense volume of the yacht SC 154 makes the interior very versatile. Options for a galley on deck, master on deck or even multiple guest cabins on the main deck can be achieved. Below on the lower decks the yacht truly shines as she is capable of up to six large guest cabins in one hull, leaving the other hull available for spa, gym, galley, cinema, crew mess and cabins. A width of 14 ft to each hull offers the opportunity to let your imagination run wild with the interior of this truly unique yacht. Aft on the lower decks, large garages in each hull will be able to accommodate tenders up to 17ft in length along with plenty of remaining space to house dive stations, jet skis and any other toys the owner would like to have on board. Tenders and toys can be easily launched via the large balcony doors in the side of the hulls. Another great feature of this truly unique yacht is the ability to launch the tenders in the middle of the yacht (inside the tunnel as to the traditional outboard sides). The heart and soul of the SC 154 (engine room) has the capability of harnessing 4 MTU 4000s (2 Per hull) coupled to water jets. All systems on board will be truly redundant to insure safety of guest and yacht on long voyages. Transatlantic fuel range has been incorporated into the design to allow the vessel to travel anywhere. A shallow draft of 6.5ft will enable the yacht to enter the shallowest of anchorages that her mono hull counterparts will never be able to cruise. Construction of the hull will be in aluminum with the superstructure constructed of fiberglass and carbon, or the option for a full carbon/Kevlar superstructure that will give the yacht an even lower center of gravity and reduce weight drastically, being one of the lightest, strongest vessels in her class. Along with the Super Cat 154, two other sister designs have been created, 137ft and that of a 117ft, both the 137 and the 117 follow very closely in design with their larger sister. With many years of hands on experience as Captain and crew on every kind of vessel imaginable, the 154 will be a dream for crew and owner to be able to interact with. SFG Yacht Design & Management is currently based in Dubai and working on projects all around the world. SFG Yacht Design & Management offers a very wide array of services that not only include the full design of a yachts exteriors and interiors, but full management of new builds, refits, crew management, accounts and custom fabrication in unique parts for yachts that Franco Gianni truly takes great pride in.